The first 2009 title I’ve read, and it’s a good one. Paul Malmont’s debut The Chinatown Death Cloud Peril, in which several legends of pulp fiction find themselves caught up in a plot they could have devised, is one of my favorite novels of recent years. His follow-up also involves real-life figures but in a less fantastical tale. Hobart Bosworth is largely forgotten now, but this contemporary of D. W. Griffith was a big name in the early days of Hollywood. In 1915, however, he finds himself at the end of his tether, verging on bankruptcy and about to lose his company to partner Adolph Zukor and the nascent Paramount Pictures. But Bosworth, famed for his adaptations of the hugely popular works of author Jack London, has a plan: to persuade London to write an original screenplay. Step one is to track London down. Step two is to save him from himself. Once Bosworth locates London in Hawaii, the paradise of the title, the story meanders somewhat. But Malmont’s bracing descriptions of the landscape, physical action, London’s tumultuous marriage, and two men facing different kinds of crises more than compensate, and the various threads coalesce into a potent ending. Malmont is a name to watch. This is the 1,000th post I’ve written for this site. Reaching the four figure mark in a little under five years isn’t that impressive compared to the output of the bloggers I emulate and frequently rip off, like Ed, Bill and Ivan, but it’s not bad, either. Whenever the dark carnival that is Noir City rolls into Seattle, as it will next month, Rosemarie and I are at every screening. But host and programmer Eddie Muller told us more than once that we weren’t getting the full experience until we took in a double bill at the Castro Theater in San Francisco, the place where Noir City was born. This year, we decided to rectify that. On Saturday night, we were part of a crowd over 1400 strong, the second consecutive sell-out of the festival. Things get off to a rollicking start with David Hegarty on the Castro’s mighty Wurlitzer organ, playing a mix of favorites from the ‘20s and ‘30s. He finishes the set with a rendition of San Francisco, the crowd clapping along as the Wurlitzer sinks below stage. The evening is a tribute to actress Arlene Dahl, so after a few welcoming words from Eddie Wicked as They Come unspools. Arlene plays a woman hell-bent on escaping her drab working class life, no matter how many seductions it takes. Wicked, based on the novel Portrait in Smoke by Bill S. Ballinger, is a familiar story complete with pat psychological explanation, but Arlene plays the bad girl with such relish that it goes down easy. Ms. Dahl, glamorous and fiery of both spirit and mane at age 83, is in attendance along with her son, actor Lorenzo Lamas. (Dude, it’s Renegade!) Eddie interviewed her on stage over champagne. She talked about her memorable first day on the MGM lot (watch the hands, Errol Flynn! ), working with the great cinematographer John Alton and director Anthony Mann on the Noir City discovery Reign of Terror, her relationship with John F. Kennedy. She won me over completely by speaking highly of Chez K favorite Dennis Morgan, her co-star in her first “official” movie My Wild Irish Rose. A redhead, Ms. Dahl said she was often used “to bring color” to films, but what she really loved was to play the femme fatale. The twain met in our next feature, Slightly Scarlet, which teamed Arlene with fellow titian titan Rhonda Fleming. I had seen the movie before, but never in Technicolor on the big screen. Yowza. In this James M. Cain adaptation the ginger goddesses play sisters – Arlene’s the bad one – who both fall for intellectual gangster on the make John Payne. It was every bit as delirious and unhinged as I remembered. I’m still fairly certain the ending makes no sense. And the capacity crowd ate it up. That was it for the movies, but there was more noir to come. We went to the fabulous Kayo Books, where I nearly wept at the sight of so many pulp classics up for sale. I should have brought a second empty suitcase with me. Still, I made a dandy haul that included some Fredric Brown, a copy of Joel Townsley Rogers’ The Red Right Hand to call my very own, and a Johnny Liddell thriller by Frank Kane, who wrote pretty much every episode of the old Mickey Spillane’s Mike Hammer TV series. Across the street from Kayo is the apartment building where Dashiell Hammett lived while he wrote Red Harvest and The Maltese Falcon. I stopped by to pay my respects, and later went to the corner of Bush and Stockton, where Miles Archer breathed his last in Falcon. Cocktail report: I’d long wanted to bend an elbow at Bourbon & Branch, and I’m happy to report it’s as good as advertised. The rye maple fizz on the new menu is extraordinary. I’d also heard great things about the Alembic Bar but was concerned that Haight-Ashbury would be a bit out of the way on this trip. I needn’t have worried. (Thanks, Todd and Chad!) The Alembic is worth making time for. Their Vieux Carré had me flying before I reached the airport. It was the perfect way to wrap up a fantastic weekend. More photos are up at my Flickr page. At last I have caught up with the two adaptations of Dashiell Hammett’s The Maltese Falcon that preceded John Huston’s definitive 1941 version. In the process, I received an object lesson in screenwriting. No bones about it: 1931’s The Maltese Falcon is lousy. It’s stilted, and despite an interesting supporting cast – Thelma Todd, 42nd Street’s Una Merkel, the original Renfield Dwight Frye as Wilmer the gunsel – is hamstrung by having the one-dimensional Ricardo Cortez play Sam Spade. Mainly, though, it’s a perfect example of playing the notes but missing the music. Many of the beats and lines of dialogue that Huston took directly from Hammett’s novel are here, yet each one feels off. Brown Holmes – now that’s a moniker! – cowrote the ’31 film and received solo credit on Satan Met a Lady, which treats the story as more of a comedy. Prevented from using Hammett’s names, Holmes threw the Falcon out as well; here the MacGuffin is a ceremonial ram’s horn stuffed with jewels. He also reinterpreted the characters. Spade’s capable secretary Effie Perine is now a ditz, but one who may not be as dizzy as she seems. The Levantine Joel Cairo becomes enormous Englishman Arthur Treacher. And “the fat man” Kasper Gutman is a woman. Who is, to be fair, still pretty big. Again key scenes survive from the book, but Holmes mixes them up, reassigning dialogue and bits of business, playing them for laughs. The thing is ... it works. The documentary on the DVD had me hating Satan in advance, only using clips that made it appear foolish. As it happens, my main dislike was Warren William’s enormous hat. It’s a testament to Hammett’s novel that it survives adaptation even when pushed into Thin Man territory. Both movies are considerably shorter that the ’41 Falcon. One reason is that the scripts eliminate my favorite scene, where Spade blows out of his initial meeting with Gutman in order to test the fat man, only to return and learn the statue’s history. I understand why this edit was made; it’s a common note to collapse scenes so locations aren’t repeated unnecessarily. But we lose a great moment. It’s also worth noting that the two earlier films break the first-person POV hewed to so rigorously by Huston and taken to its logical extreme by Robert Montgomery in his adaptation of Raymond Chandler’s Lady in the Lake. After Miles Archer’s murder in the ’41 film, Spade appears in every scene. The other films accelerate the action by cutting away from Spade to follow the conspirators or the police. These moments by themselves don’t hurt the films, but they do break the spell. Satan Met a Lady will air on TCM as part of its Bette Davis tribute – Bette Davis is in it, did I mention that? – on January 26 at 11:15AM EST. This interview with my friend Eddie Muller paves the way for Noir City, kicking off in San Francisco this weekend. This year’s irresistible theme is newspaper noir. The exception is a special event this Saturday honoring actress Arlene Dahl with a Q&A and screenings of her films Slightly Scarlet and Wicked as They Come. Yours truly will be at that event. I’ll also be at every screening when Eddie brings Noir City back to Seattle next month. And while I won’t dress vintage, I will dress appropriately. Jeff Pierce of The Rap Sheet introduces the spin-off site Killer Covers of the Week. This ad is NSFW. It’s also the funniest thing I’ve seen in weeks. It occurred to me as the film ended this afternoon that every time I’ve seen Vertigo it’s been on the big screen. I’ve never watched it on television. I think I’ll keep it that way. If you’re in this neck of the woods, check the schedule and make your plans. Whoops. These nominations have been out for days. Special congratulations to VKDC favorite Christa Faust, getting a nod in the always-tough Best Paperback Original category for Money Shot. Patti Abbott was kind enough to ask me to participate in her Friday’s Forgotten Books series again. You could make the argument that choosing a novel nominated for both the Hugo and the Nebula Awards and handsomely reissued in 2005 means I have a loose definition of the word “forgotten.” But as far as I’m concerned, nowhere near enough people know about George Alec Effinger – and that includes crime fiction readers. When Gravity Fails is the first of Effinger’s novels set in the Budayeen, the shady quarter of an unidentified Middle Eastern city in the late 22nd century. It’s the place Marîd Audran calls home. A street-level operator always willing to do a favor provided you meet his price, Marîd is the Budayeen’s answer to both Jim Rockford and Matt Scudder. He finds himself drawn into a string of brutal murders that target Friedlander Bey, the quasi-benevolent 200 year old kingpin of the Budayeen. Bey in turn drafts Marîd into becoming his personal private investigator. Effinger’s world, rich in detail, is one where the West has long been in decline and life has taken on a decidedly Islamic cast. Into it Effinger injects an array of societal and technological evolutions. Abuse of sophisticated neurological drugs. Elaborate transgender surgeries. And that most desired of upgrades, cranial modification. Once you’ve been wired, you can chip in personality modules (“moddies”) that allow you to become anyone you wish, or “daddies” that temporarily give you whatever skills you require. In the first chapter, a man wearing a James Bond moddy commits a cold-blooded execution. Later, after being forced by Bey to undergo modification, Marîd becomes Nero Wolfe to solve the case. Effinger’s deft depiction of how devout believers deal with these advances is one of the book’s joys. Effinger followed up Gravity with A Fire in the Sun and The Exile Kiss. Additionally, several short pieces are collected in Budayeen Nights. They’re all worth reading for fans of mystery and SF alike. Effinger’s Budayeen tales are the rare works of speculative fiction that function as a crystal ball. More and more it seems that the world he created in these pages is the one we’re rushing toward headlong. In the late actor’s long career, there were several distinct phases. Stardom in Mexico. Making waves with Esther Williams. “I am Mr. Rourke, your host.” Soft Corinthian leather. Star Trek II: The Wrath of Khan. An entire generation of kids now knows him as the grandfather from the Spy Kids movies. Not many performers stay relevant for so long. But you know the Montalban who will be celebrated here: the hard-boiled one. The undercover federale working hand in hand with an American agent to bust an immigrant smuggling ring in Border Incident. The small-town cop faced with big city murder and willing to take a chance on the boys in the lab in the proto-CSI Mystery Street. The detective itching for some of his crooked partner’s action in The Money Trap. All good movies made better by Montalban’s charismatic presence. Mark Evanier has a story about working with Ricardo Montalban that’s a good one. What a singularly odd movie. Where to begin? Let’s get the plot out of the way. Itinerant wharf rat Bobo (Jean Gabin) saves the life of suicidal “hash wrangler” Ida Lupino. Their budding romance is enough to keep him working at a bait barge in a California harbor. But Bobo may have committed a murder during an alcoholic blackout. And his only friend, played by Thomas Mitchell, may be willing to trade on that fact to secure his own future. The story of the movie, full of almosts and near-misses, is far more interesting than the one in it. 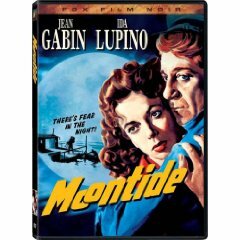 Moontide was meant to serve as the great Gabin’s introduction to a wide American audience; the film’s mixed reception contributed to his return to France. The source novel, by character actor Willard Robertson, is by all accounts a catalog of depravity that was greatly watered down for the screen. Original director Fritz Lang walked off the production – apparently due to a clash with Gabin over mutual paramour Marlene Dietrich – and was replaced by Archie Mayo. Salvador Dali contributed to the blackout sequence, only to have other hands complete the actual design. I’d love to say that Moontide transcends such turbulent origins, but I can’t. Every compromise shows. The movie is a jumbled, fascinating mess. At first, novelty carries the day. Nothing in Moontide feels remotely real. That otherworldly mood is partly a result of logistics; plans to shoot in San Pedro, California were scrapped after Pearl Harbor, so filming took place on a huge soundstage. But mainly it’s the forced marriage of American and European sensibilities that anesthetizes the proceedings. After a while longueurs set in, to use le mot juste. The thin, obvious story doesn’t help much. Neither does the self-conscious approach to the lives of “little people.” I wouldn’t have been surprised to read the credit “Written by Barton Fink.” The actual script is by novelist John O’Hara. Gabin lobbied to cut out stereotypical French behavior, but he still manages to carve exquisite jambon in his performance. He does have several fine moments, like one on the restorative powers of breakfast. Mitchell’s jovial stage Irishness has rarely been put to better use. Lupino and Claude Rains work their customary magic. I don’t care what Fox says, Moontide is not noir. It’s melodrama. Pure, uncut, prison-grade melodrama. If you are compelled to call a character Bobo, do not compound the error by having everyone repeat his name. It’s posed by Bill Crider. UPDATE: The link is now fixed. The Rap Sheet collects memories of and tributes to Donald E. Westlake from dozens of crime writers in two posts. Also, a reminiscence by director Stephen Frears, Westlake’s collaborator on The Grifters, and Westlake talks to Ed Gorman about the return of Parker. The first week of the year is always a mess, isn’t it? I’m on a new schedule, which is actually an old schedule, and as a result I haven’t had time to update the site these last few days. I tried, though. I took a whack at that sixteen random things meme making the rounds and realized that there are only eleven salient facts about me. And only six of them are interesting. So until equilibrium is restored, check out some other blogs of note. Like author Tom Piccirilli’s The Cold Spot. Or JohnAugust.com. This recent post outlining his involvement with the Captain Marvel movie is as good a primer on how Hollywood works as you’ll find. I know, that’s not enough. Tell you what. Here’s a song that Cary Grant used to perform at parties. It’s sung to the tune of “My Bonnie Lies Over the Ocean.” I learned it from the book I’m currently reading, Roger Moore’s memoir My Word Is My Bond. Go on, try to do it in Cary’s voice. Oh, all right. I know what you really want. On some scores, I am as good as my word. I said that I would reread the new University of Chicago reissue of The Hunter that I picked up the day before Donald E. Westlake died, and I did. It’s not like it was difficult; everything Donald Westlake wrote goes down smooth. Some random thoughts. The book is meaner and even darker than I remember. It’s plain that Mr. Westlake didn’t intend to start a series that would last 40 years with this novel, but the intervention of an editor changed that. He could look out at the street, and let his fifteen-cent cup of coffee cool. It was a Park Avenue coffee shop, and expensive. Pastrami on rye, eighty-five cents, no butter. Like that. Like that. That phrase is an example of how, as Lee Goldberg noted, Mr. Westlake “wrote books that inspired people to become authors.” He made it look effortless. 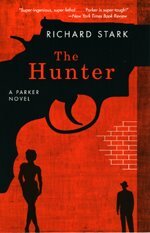 The Hunter, like many Westlake books, is so attuned to the city of New York that it can be plotted on a subway map. So far it’s been filmed twice, as a definitive Los Angeles movie and then in Chicago. Point Blank was acclaimed for its Nouvelle Vague-influenced storytelling, but the structure deployed in the Parker novels – four sections, with three from Parker’s POV and the fourth from other characters related to the job at hand – is every bit as impressive, with a formal rigor of its own. The Hunter features one of its more dazzling uses. Parker attempts to gain entry to a building, and things go wrong. Horribly so. Westlake generates tremendous suspense from this sequence even though we already know that Parker’s target is no longer in the building. ... and the poor G, the Brooklyn-Queens crosstown, which never gets into Manhattan at all but just shuttles back and forth between Brooklyn and Queens, full of people wearing hats. Tributes to Donald Westlake are all over the web, many of them collected at Sarah Weinman’s Confessions of an Idiosyncratic Mind. I’d recommend the ones by Duane Swierczynski and Max Allan Collins. But the most astonishing is by Ethan Iverson of The Bad Plus, who carried on a longtime email correspondence with Mr. Westlake. If you’re a fan, it’s a must-read. And I’ll echo Jeffrey Wells and say that now more than ever, we need a quality DVD of 1973’s The Outfit. Not only does it feature a cast of noir legends like Robert Ryan, Marie Windsor, Timothy Carey, Jane Greer and Elisha Cook, Jr., it’s also the Parker movie that Donald Westlake himself said was his favorite. If absinthe were a band, it would be Interpol, third-hand piffle masquerading as transgressive pop culture. If absinthe were sneakers, it would be a pair of laceless Chuck Taylors designed by John Varvatos for Converse. If it were facial hair, it would be the soul patch. If absinthe were a finish on kitchen and bath fixtures, it would be brushed nickel. Falcon was my first movie of 2009. I always watch a classic on January 1 to set the tone for the rest of the year. And it’s preparation for a jaunt to San Francisco later this month to take in some of Noir City. One of my favorite scenes is the initial encounter between Sam Spade (Humphrey Bogart, but you knew that) and “the fat man” Kasper Gutman (Sydney Greenstreet). They take each other’s measure with that sparkling Dashiell Hammett dialogue left largely untouched by John Huston. (“Here’s to plain speaking and clear understanding ... I’ll tell you right out I’m a man who likes talking to a man who likes to talk.”) Spade tries to leverage what he’s learned into more information, but Gutman refuses to play along. So Spade erupts, hurling his glass down, threatening Gutman’s gunsel Wilmer, and storming out of the room. It’s a startling moment. Cut to the corridor. As Adolph Deutsch’s music takes a turn, a smile spreads across Spade’s face. Losing his temper was an act, a way of stirring the pot. What makes the scene is that as Spade presses the button for the elevator, he notices that his hand is shaking. And he smiles at that, too. As I watched it for the umpteenth time, I thought: no way this scene would play out like this today. Spade would still pitch a fit, of course. Only we’d be told about it in advance. The hero of the movie appearing not to be in control? That note would be fast in coming. We’d get a simple dialogue fix, Spade telling loyal secretary Effie Perine that he’ll raise a ruckus if the fat man won’t play ball. And something ineffable would be lost. I’ve had this deluxe edition of Falcon for ages, but I’ve yet to watch either the 1931 adaptation or the ’36 version Satan Met A Lady. That situation will shortly be rectified. I did, however, watch the 1941 Warner Brothers blooper reel included on the DVD. Profanity in black and white? Jimmy Stewart cursing? Unbelievable. Brush up your web links. Aaron Hillis takes over GreenCine Daily, while outgoing editor David Hudson begins working his magic at IFC.com’s The Daily. David does a superhuman job collecting all the net’s film news at a single location. It’s worth bookmarking his site and reading it every day. A sad start to the new year. Donald E. Westlake died late yesterday. Mr. Westlake was one of my all-time favorite authors. More than that, he was one of the best. Named a Grand Master by the Mystery Writers of America, and considered one of the greatest writers of the 20th century by some critics. But their opinion doesn’t matter when the novels make their own case. His older ones are forever being reprinted and finding new audiences. I just picked up the University of Chicago reissue of The Hunter on Tuesday. I admired him for so many reasons. His versatility. Writing wry comic capers under his own name, then offering the genre’s photo negative as Richard Stark, books that live up to the pen name. His longevity. Starting in the pulps and ending his career with some of his strongest work, like 1997’s The Ax, a book I’ve been thinking of a lot these last few months. His ability to work in different mediums. He cowrote the script for the marvelous thriller The Stepfather and was nominated for an Academy Award for his adaptation of Jim Thompson’s The Grifters. His matchless skill at capturing the rhythm and flavor of life in New York City. A Westlake coinage – “Harya” – is still my greeting of choice. I never met Donald E. Westlake, but I felt like I knew him. I’m certain that I’m going to miss him. I’m going to start rereading The Hunter right now. When a fresh-faced guy in a Chevy offered him a lift, Parker told him to go to hell. The guy said, “Screw you, buddy,” yanked his Chevy back into the stream of traffic, and roared on down to the tollbooths. Parker spat into the right-hand lane, lit his last cigarette, and walked across the George Washington Bridge.